Ventilated box lockers are great for storing items that need to remain secure, dry, and fresh. The diamond perforated sides allow air to flow freely through the locker, which keeps items secure but allows wet items to dry to prevent mold, mildew, and odors. 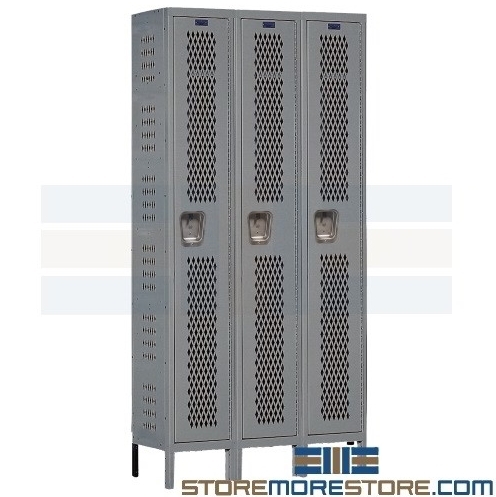 These lockers are also great for schools, as they store student belongings securely while keeping them visible. A few storage applications include uniforms, gym clothes, purses, backpacks, lunchboxes, small electronics, shoes, and other belongings. The lockers are available in three compartment sizes (single, double, and six-tier) depending on your storage needs. Optional coat rods store hanging clothing in single-tier lockers. Heavy-duty steel construction ensures long-term use in any environment. Stainless steel recessed handles prevent marring from padlocks to keep a professional appearance. Continuous piano hinges provide an extra level of support along the entire locker length to minimize wear and tear from normal use. Since the hardware is not exposed, the hinges also prevent tampering or damage due to environmental conditions. 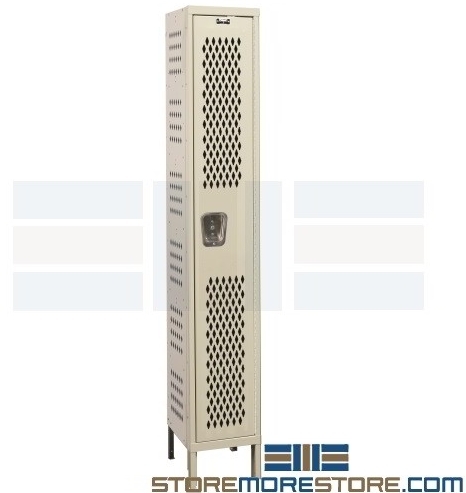 Ventilated box lockers are available to buy online and ship in 7-10 business days (add 5 for assembled). For further assistance, call us at 1-855-786-7667 or send us a message to speak to one of our experts.